Brigs ower Vigala River. Rapla kirk in the backgrund. 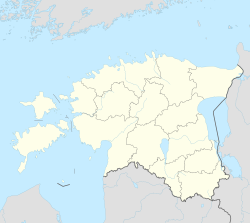 Rapla is a toun in central Estonie, the admeenistrative centre o Rapla Coonty an Rapla Pairish. It haes a population o 5,618 (as o 1 Januar 2008). ↑ 1.0 1.1 "Üldinfo". Rapla vald. Retrieved 9 October 2010. Wikimedia Commons haes media relatit tae Rapla.